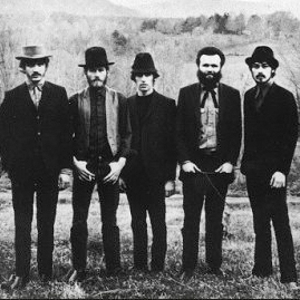 Levon Helm (second from left), the drummer and singer with The Band, died today from throat cancer. I have read many tributes today, so I know I wasn't the only one sitting alone and listening to their music when I was a kid. Jesse Kornbluth over at the Huffington Post wrote that The Band were "...five bearded men who looked as if they'd stepped out of a Matthew Brady photograph..." It's a very good line. When their first album Music From Big Pink was released in 1968, they were men, not boys. They were the back-up for Ronnie Hawkins starting in the late 1950s, and they gained more fame and some infamy as Bob Dylan's back-up band when he went electric. They had called themselves The Hawks when they played behind Ronnie Hawkins, and they had some gigs as Levon Helm and the Hawks. But since they had spent so much time as a back-up band, they decided the name The Band would be good. It might sound modest and generic, and there might be a little of that in the decision. But they were also The Band every other band was trying to be as good as. The harmonies of The Band are family harmonies from the South, the way the Cox Family sounds on the Oh Brother Where Art Thou? soundtrack, the sound of Charlie and Ira Louvin captured on vinyl back in the 1940s. When Levon sings "Virgil Caine is my name and I worked on the Danville train" at the beginning of The Night They Drove Old Dixie Down, it is the purest sound of the Southern sadness, the men who did not start the war but fought the war and lived with the privation it brought. It can break your heart. Levon wasn't always the voice of sadness. The music has a little melancholy to it, but Up On Cripple Creek is one of the greatest lyrics of a man recalling good times. When I get off of this mountain, you know where I wanna go. Straight down the Mississippi River to the Gulf of Mexico. To Lake Charles, Louisiana, there lives a Bessie girl that I once knew. She told me just to come on by if there was anything that she could do. I'm hearing a lot of Levon's song in my head today, Some makes my cry, but overall I could not be happier that I know his music and I saw him play. He was one of the truly great musicians and we were lucky to share the planet with him. Oh, I remember seeing that album in our house; thanks for writing this excellent obit. RIP Levon.